Outsiders Yamaha Official Enduro Team are all-set to begin another exciting season of FIM Enduro World Championship competition in Finland. Following a productive week of testing in real winter conditions, team riders Loïc Larrieu and Jamie McCanney are looking forward to a positive start to their 2018 campaigns this weekend in the frozen Lake Paijanne. 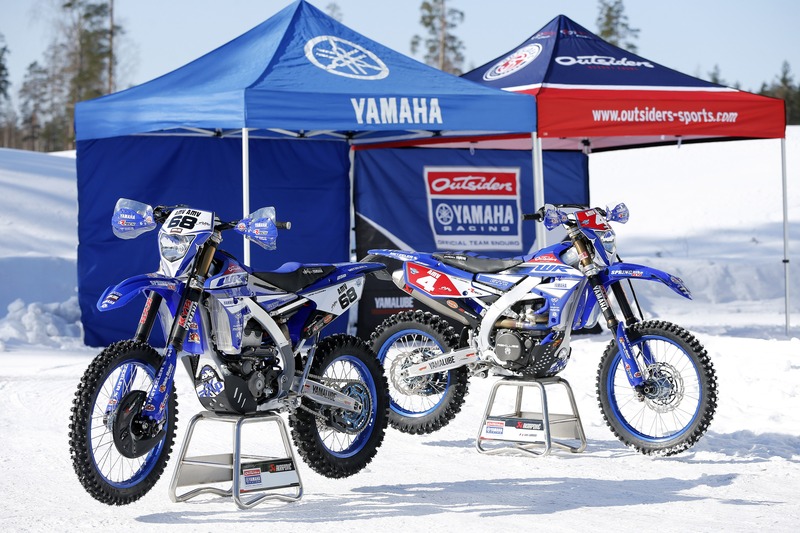 With the season opening GP expected to be an all-snow affair, the duo of Outsiders Yamaha Official Enduro Team riders will be looking to make the most out of the experience gained from their first participation at the Finnish EnduroGP a year ago. Featuring an estimated total of 18 hours of racing in extreme winter conditions throughout the weekend, the season opener will be a tough challenge for all racers. Loïc Larrieu, the 2017 EnduroGP World Championship runner-up, enters the 2018 series as a favourite for championship honours in the updated Enduro 2 class. Remaining aboard WR450F machinery, the Frenchman will also be aiming for the sharp end of the overall EnduroGP class’ results this weekend in Finland. Making a strong statement in 2017 with five victories and an impressive second in the Enduro 2 World Championship, Jamie McCanney will lead Yamaha’s charge in the updated 250cc Enduro 1 class for 2018. Aboard his WR250F machine, the Manxman is looking for a strong start to the series in the extreme conditions of the Finnish GP. The eight-round-long 2018 FIM Enduro World Championship kicks off on March 17/18 with the GP of Finland taking place in Paijanne, Helsinki. Johansson Yamaha Official Junior Enduro Team rider Albin Elowson will join his Yamaha teammates at the start of the Enduro Junior World Championship on April 27/29 in Spain.